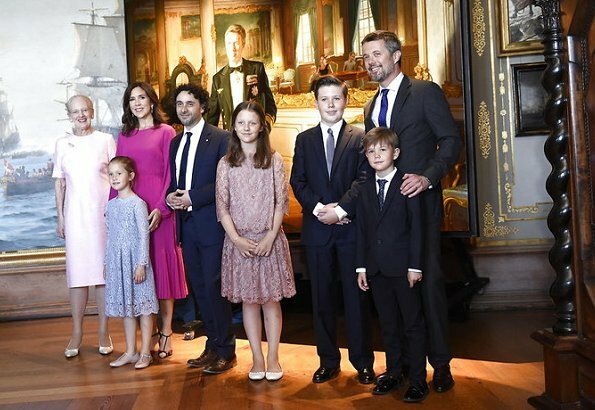 In connection with the Crown Prince’s 50th birthday, Queen Margrethe, Crown Prince Frederik, Crown Princess Mary, Princess Isabella, Prince Christian, Prince Vincent and Princess Josephine attended the unveiling of a new portrait of the Crown Prince. 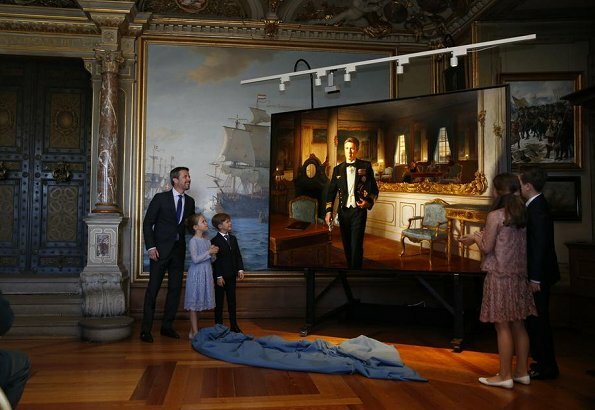 The portrait unveiling ceremony took place at The Museum of National History at Frederiksborg Palace. The new portrait will be the centrepiece of "Portraits" exhibition consisting of the portraits of the Australian artist Ralph Heimans. Mary looks wonderful and Isabella is such a pretty girl! 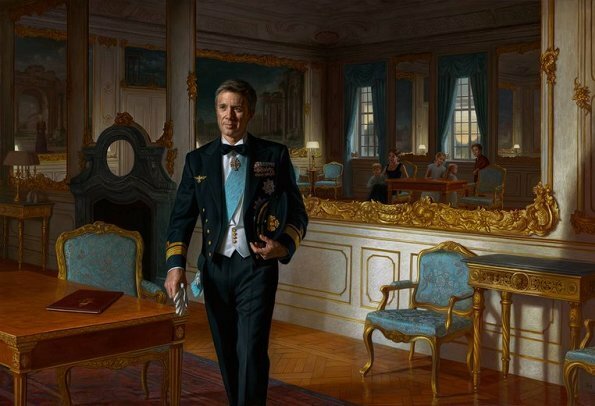 The painting is very skillful, a real old-school masterpiece, but I don´t think that it looks like Fredrik. As for the royal family and their outfits, I like everything here. The kids are dressed very well (and Isabella is a great example of how a pre-teen can dress age-apropriately). Mary´s dress is alright, but doesn´t thrill me. Margrethe´s dress on the other hand I find just as lovely as the first time she wore it (in Africa?). So fresh, so simple, so flattering. Everyone looked great. In this painting it seems the Prince is stepping out of the painting and walking toward them. Nice to see the whole family being there. 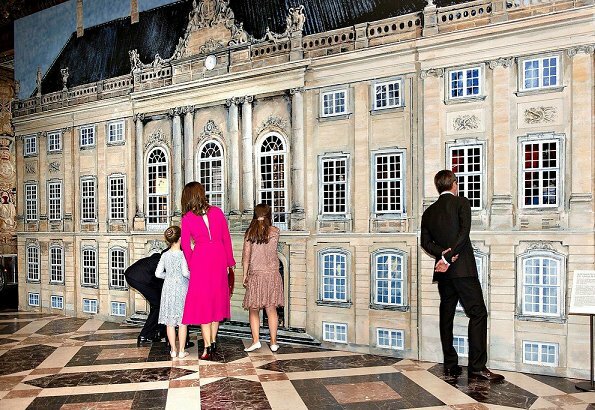 Oh, that was not such a good painting, I can barely see Frederik in the person in the picture. 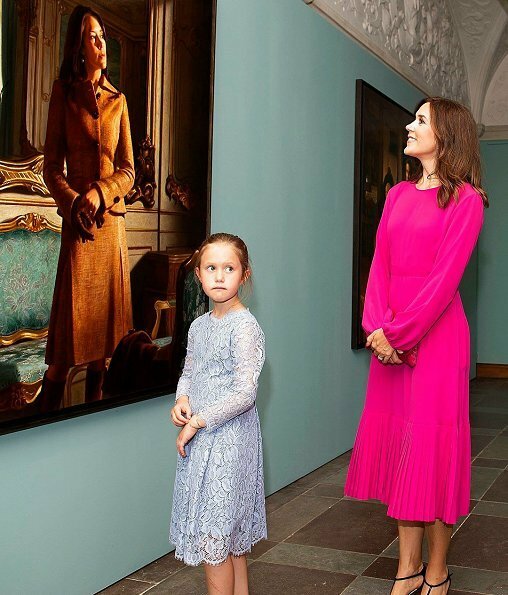 The queen looks very nice in her pink dress, though, she seems to have lost some weight and aged a bit since Henrik's death. Mary is well dressed and beautiful as usual and the kids look professional! She sure does, grief is so difficult. They definitely look like one team/one family. Just beautiful! 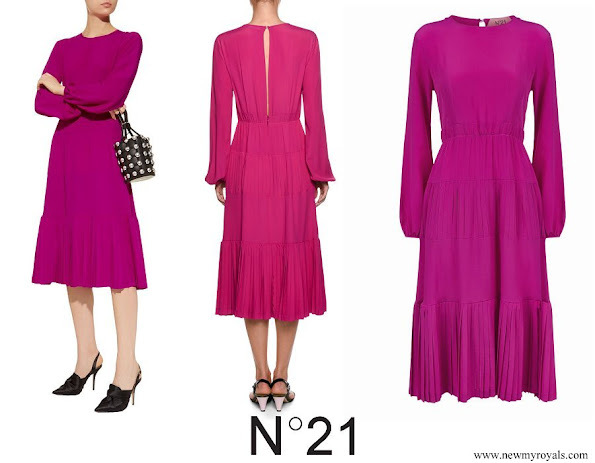 Shade of pink is energetic and magic.I like that princesses wear the same dress but in different colours. Such a nice family. 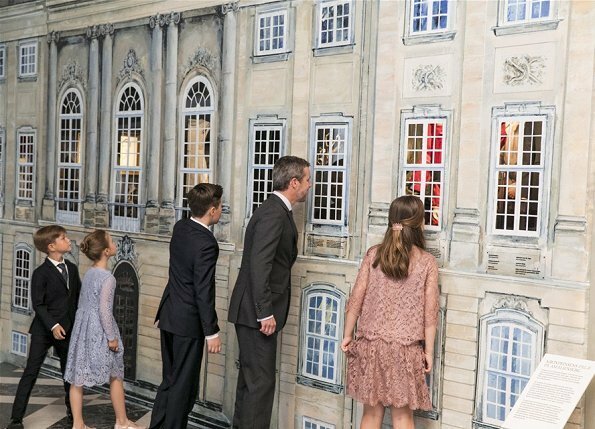 I like the pics, where they peep through the windows of Amalienborg. They look all good and happy. This is a lovely family , they are all appealing . 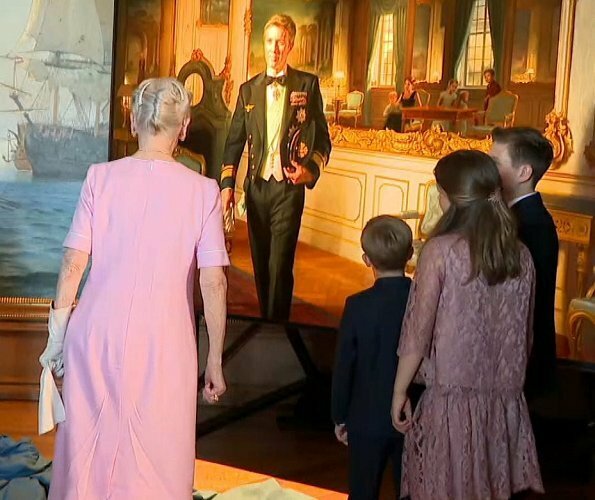 has not caught the true likeness of Frederik nor of the family in the background . Queen Margrethe and Queen Elizabeth are the Queens of all Queens, IMO. May I disagree with you, ex Queens Sofia, and Beatrix are my favourite, they're not to grand to show affection in public. And I wonder how Queen Margrethe's health is, because of her smoking, since she was a young woman? This was my first thought as well when I saw the photos: What a lovely family and all so well dressed. Fredrick and the boys look smart in their suits and the two younger girls have lovely similar dresses. Isabellas is particularly nice for her age. Mary looks nice in practically anything, though it is a nice dress in its own right and Queen Margarethe seems to have lost some weight, but still looks good. It too like the simplicity and colour of her dress. Good times, happy family. I wish them all the best. Good painting. 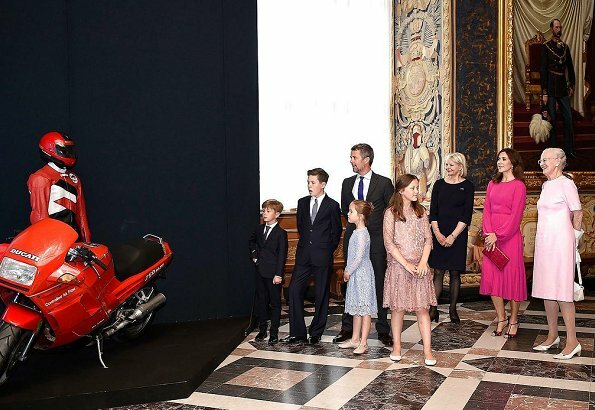 Frederik's face reveals the weight of responsibility of becoming sovereign one day. It shows him in a domestic setting (lavish, but it is his home), but as a public persona fully trained for his role, walking towards his family who have been the making of him. I'm sure there are many other symbols and hints that Danish people might know better. Totally agree with you. This must be very meaning painting to Frederick. And it will stand the time very well. In my eyes the painting also looks very much as Frederick. What is going on with Daisy?? She's been looking fresh and modern in her daywear choices lately, not outdated at all!!! 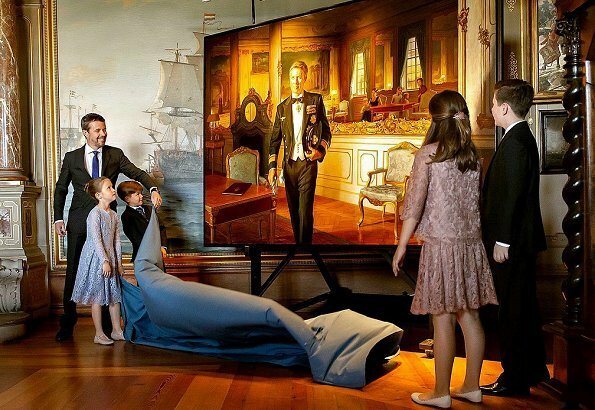 Beautiful family and I agree the painting does not look a thing like the Crown Prince but it is beautifully done. If I had not known who it was, I would not have guessed. Mary's dress is indeed beautiful, but I wonder about the opening in the back that runs clear down to the waist (!) for daytime? The little girls look splendid, and Queen Margrethe very fresh and youthful as others have said. Mary looks beautiful, that colour suits her. 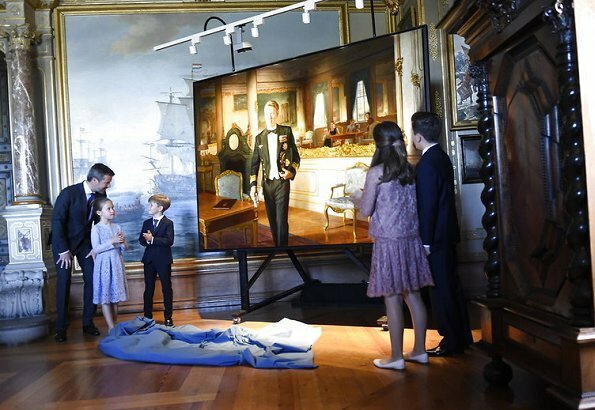 I really like the painting of Frederik, I particularly like how his family are reflected back in the mirror. A very thoughtful portrait. 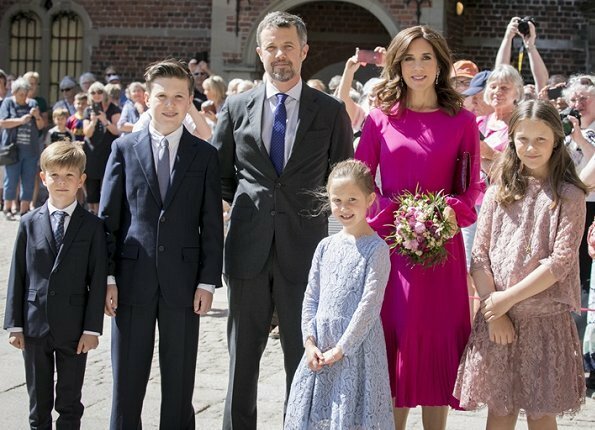 I think marriage and family was the making of Frederik.